A call to David Nichols at International Yacht Collection brings news that he closed on the sale of the 40m motor yacht Brazil just a few hours ago, working for both buyer and seller. 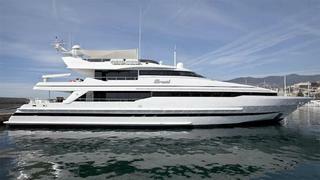 Built by Heesen in 1993, she was refitted in 2008 and comfortably accommodates 10 guests in a contemporary interior. Her twin MTU 12V 396 TE 94 diesel engines can achieve a top speed of 16.5 knots, with a cruising speed of 12.5 knots. Brazil was asking $5.45 million and David says she'll soon be heading for her new base in Europe.